Every year, I’ve been lucky enough to garner a professional badge to the San Diego Comic Con. Every year except this one. I was too slow on the draw to contact the Comic Con folks and when I did, they were out of badges. I didn’t like the situation, but what could I do? (This was after the sale of tickets.) So I spent my July hanging out with my family doing touristy vacation stuff (like SeaWorld and the La Brea Tar Pits). Then a good friend asked if I could use some comps (this would be Wednesday night, before the Con started). Of course I said yes. With no planning, I embarked on my trek through the largest and most populated convention Saturday morning. I must say, no amount of Googling would predict the length of the badge line. (Up till this point, I’d gone through the professional entrance, which is very quick.) I arrived at 8:30, right when the website said badge pickup opens. There was a long line, so I pulled out my phone to busy myself. Then the lined moved and it never stopped moving. I was up in the Sails Pavillion, badge in hand, in under five minutes. Wow! Now, by the time 9:30 rolled around the place was packed, so I imagine the badge line was longer and moving slower. TIP: arrive at the start time to get your badge quickly. 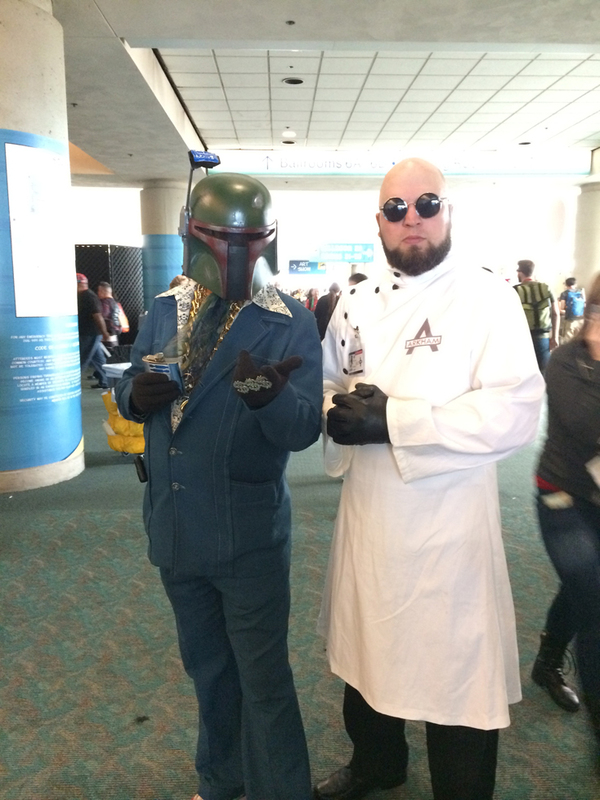 A lounge singing Boba Fett? Not quite sure who these people are. I was waylaid at the Mattel booth for far too long. Their line up system was horrific. I wanted to snag an Ever After High doll for my daughter. Wanted is the key word. I’m willing to accept long lines and product vanishing. That’s a given at the Con. But the line was “capped” so that meant no one else could enter. Then the weirdness happened. The line moved forward (cutting the number of people in half along the wall) but the security guards wouldn’t let anyone else in. They were very aggressive and rude (apparently manhandling many patrons). I heard one guard tell a guest that he would confiscate his bag and kick him out if he didn’t keep moving. 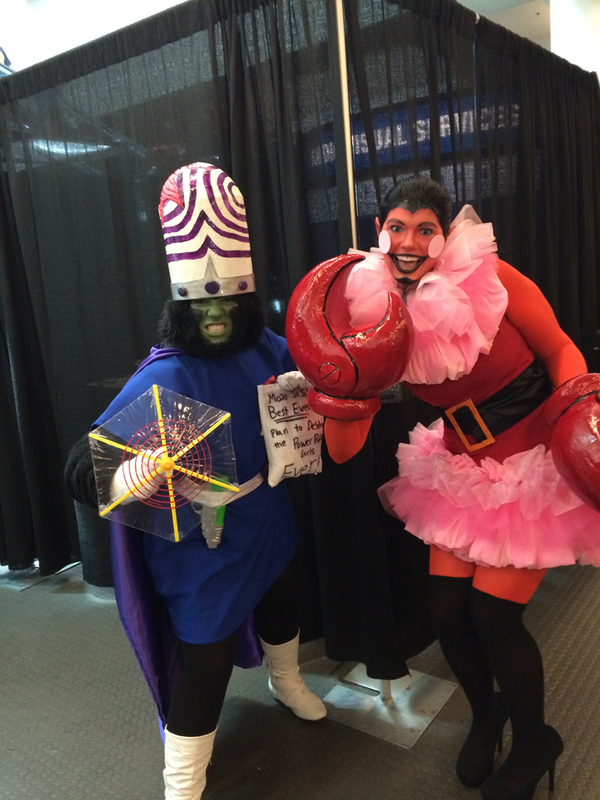 Mojo Jo Jo and Him from the PowerPuff Girls. The only way to get into the line, as far as we could tell, was to be lucky. Because people did get in. I stood on the sidelines, waiting for the capped sign to go down and let more people in, yet the line gradually grew back to its former length. I guess what you were supposed to do was circle the convention floor, like a shark in chummed water, and hope (that’s the best word) that they let you in. Ridiculous. Needless to say, I never got into the line. 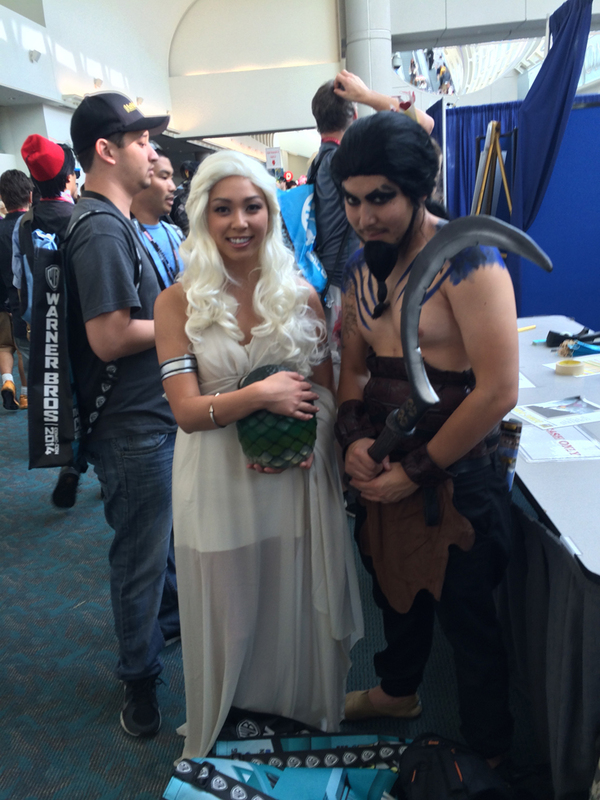 There were plenty of Game of Thrones cosplay going on: Daenerys Targaryen and Dothraki Khal Drogo. On the plus side, I was able to waltz into the Regular Show panel over at the Hilton. No line. No wait. This panel was amazing. They played the Thanksgiving song and we were gifted with an upcoming episode (The Bachelor Party). The cast was just entertaining as their characters. The panel featured J.G. Quintel (creator, Mordecai), William Salyers (Rigby), Sean Szeles (supervising director), Roger Craig Smith (Thomas), Minty Lewis (storyboard artist, Eileen), and Matt Price (story editor, Quips). I snagged grub at great new restaurant called the Werewolf Pub (yes, that’s its name, no gimmick). The food was astounding. I will certainly visit again. 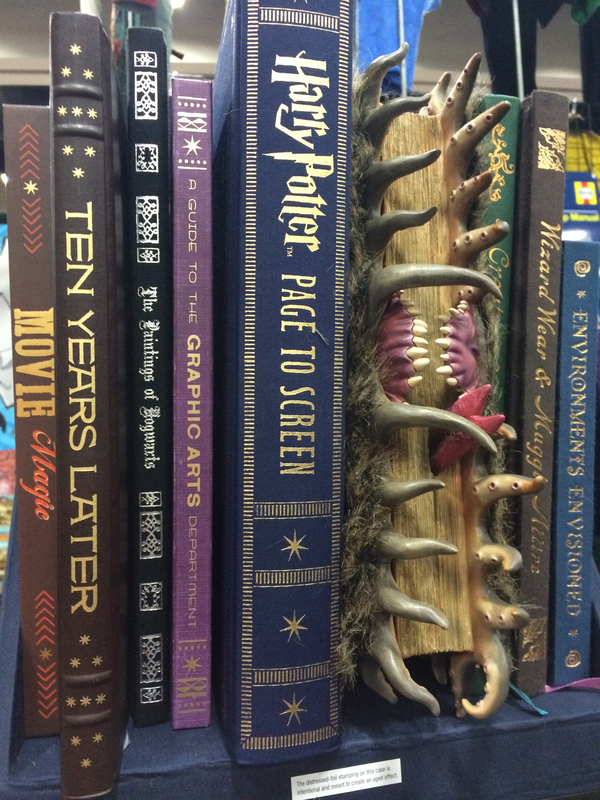 I loved seeing Hagrid’s Monster Compendium on the shelf. The other panel I visited was the Marvel S.T.A.T.I.O.N. sponsored by former S.H.I.E.L.D. agents. The whole panel consisted of real scientists who played along with the S.H.I.E.L.D. premise (we were all promoted to level 4 S.H.I.E.L.D. agents). The panel discussed the scientific underpinnings of the four Avengers (Captain America, The Hulk, Thor and Iron Man) and how their powers worked. I enjoyed the debate over Thor’s hammer. Does it hold a liquid neutron star or does it use weak and strong nuclear forces to change it’s weight? 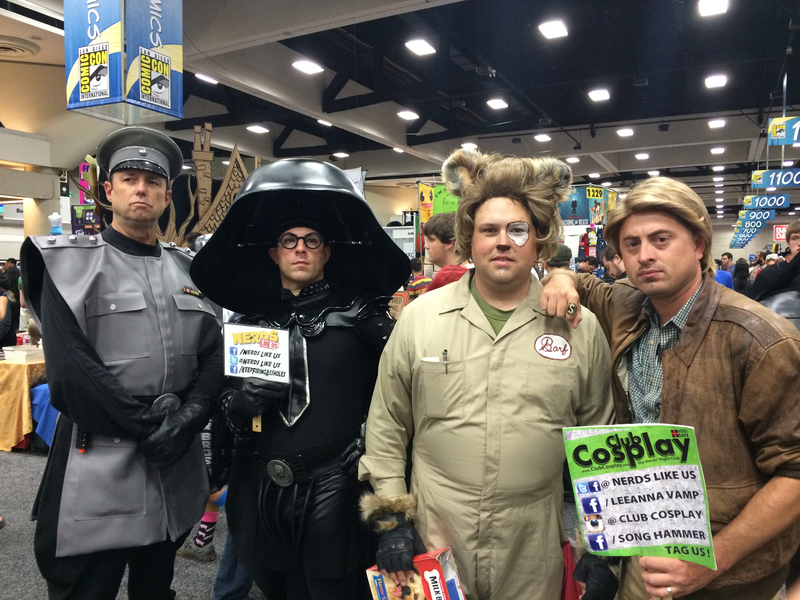 A full cosplay cast of SpaceBalls was also in attendance. Of course I shopped and snapped pictures of any interesting costumed cosplayer I could find. That’s the best part about the Con, the folks you see. Everyone (minus the Mattel guards) were courteous and polite. Even when we were crammed into an aisle like tribbles in a ventilation shaft, everyone persevered and kept their smiles up. 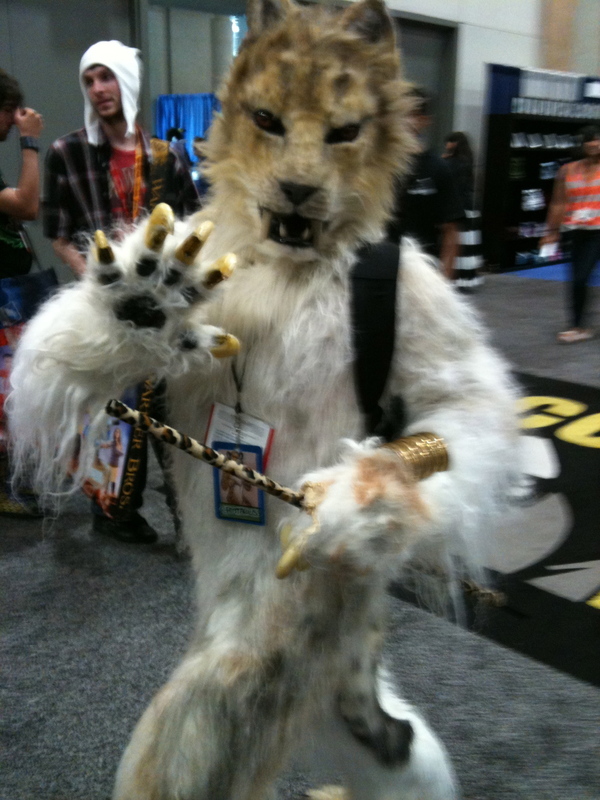 Part of the fun of Comic Con is all the folks dressed up. I snapped plenty of pictures, but not all of them came out in focus. Here are the non-blurry photos. 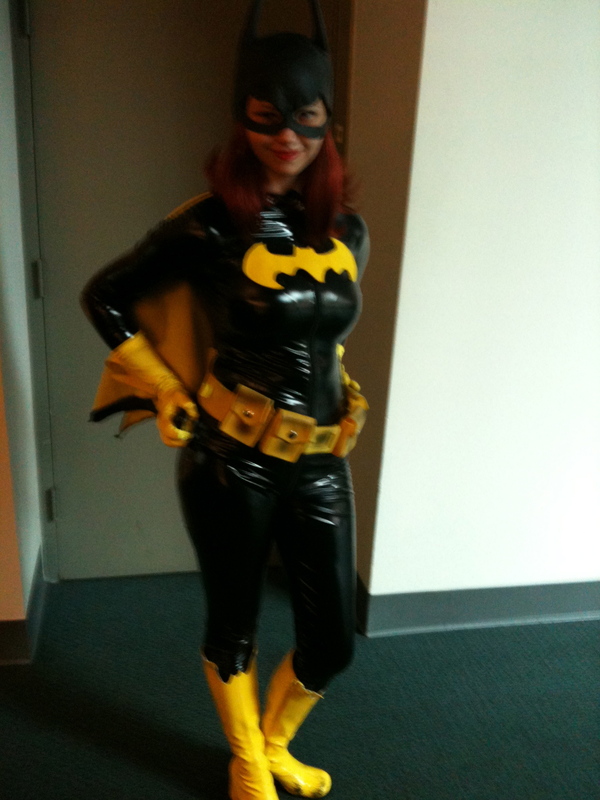 On my way to baggage check, I ran into Batgirl. Always great costumes around the Marvel booth. 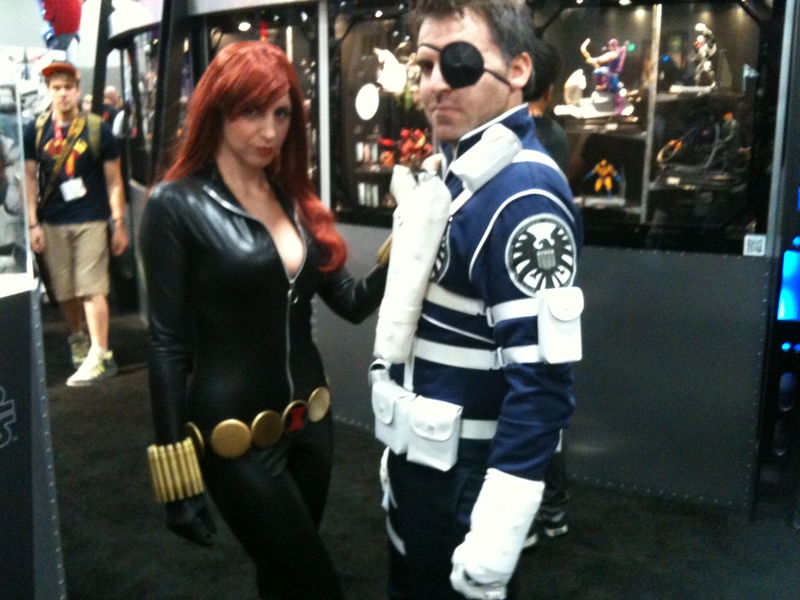 Here we have Nick Fury and Black Widow. Man. That’s some paint job. But the effect is cosmic. 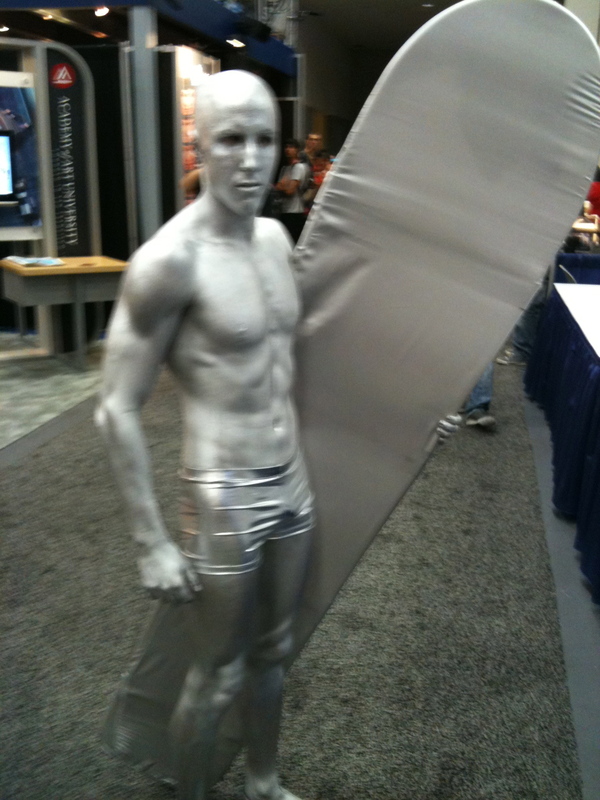 Great Silver Surfer. This guy had a fantastic Iron Man suit. He even cut his chin hairs to match Robert Downey Jr.
Everyone loves a werewolf. They do. It’s scientific fact. At least it’s air conditioned in the convention center. Even though I live in the same city as the San Diego Comic Con, I still treat it as a vacation. Thus, vacation spending. I give myself a budget and then spend every penny of it. 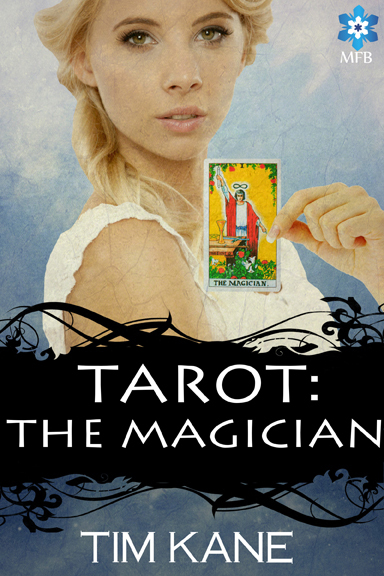 Here are some stand out items (and where to find them) on the Exhibition Floor. The first booth I plopped cash down was “Fuzzy Balls Apparel”. Yes, clever name. 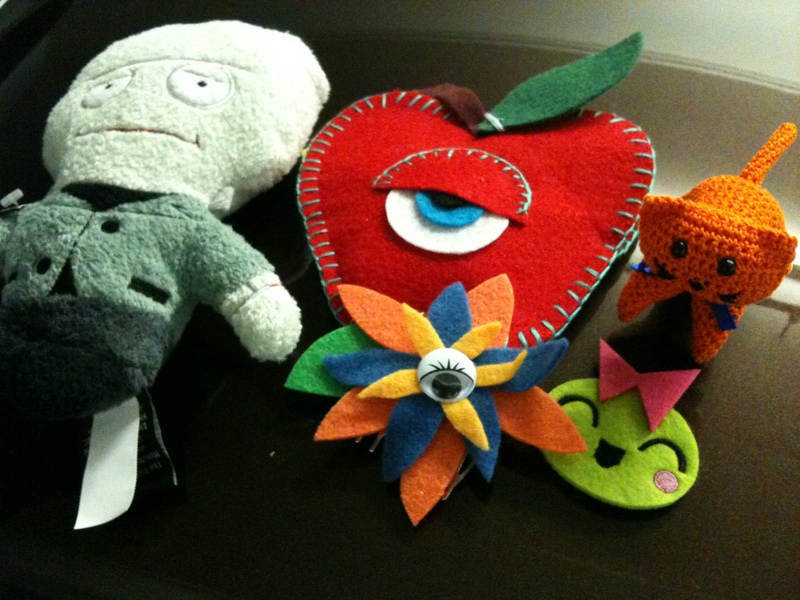 They were responsible for the hand sewn apple and the “eye” flower (which is actually a hair clip). You can find them at booth 4839. Another of my favorite booths is Conduct Happiness (booth 4832), home of the Pea, as in “pea in the pool” or the “pea pea dance.” I picked up another hair clip for my daughter here. The stuffed Frankenstein was from The Bijou Collectibles (booth C-01). I can’t recall where I picked up the stuffed kitty. 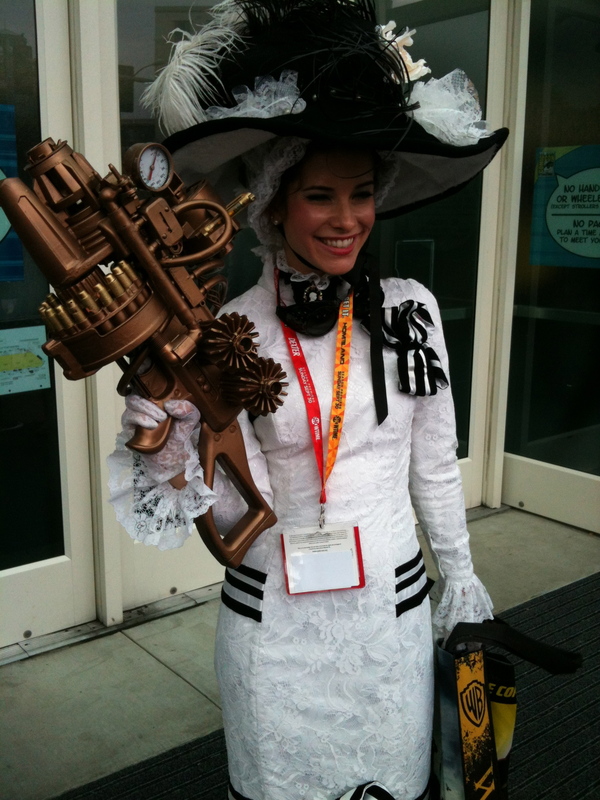 I’m always a sucker for steampunk and no one does it better than Weta (booth 3513B). 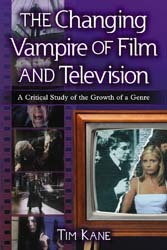 I picked up yet another fabulous book from Dr. Grordbort. This year, it was Triumph, Unnecessarily Violent Tales of Science Adventure for the Simple and Unfortunate – written and illustrated by Greg Broadmore. 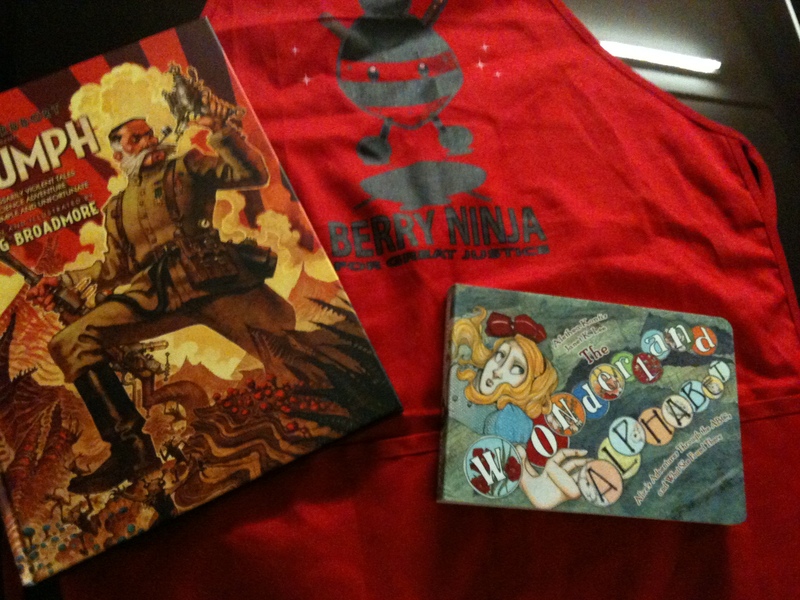 I grabbed the last Berry Ninja apron (for kids). I can’t recall the booth, but I do know it was right next to Fuzzy Balls Apparel. Finally, the small book you see is “Wonderland Alphabet” giving each letter an Alice in Wonderland twist. This was from Archaia Entertainment (booth 2635). I just read this book to my daughter. It really goes deep into both Alice Books (Wonderland and Looking Glass). I’m love T-shirts, but I detest the standard black or white fair. Snap T-shirts (I can’t locate the booth number, but it was near artist’s alley). This guy hand screens the shirts himself. Hard to see in this picture, but the shirt is a burgundy color. 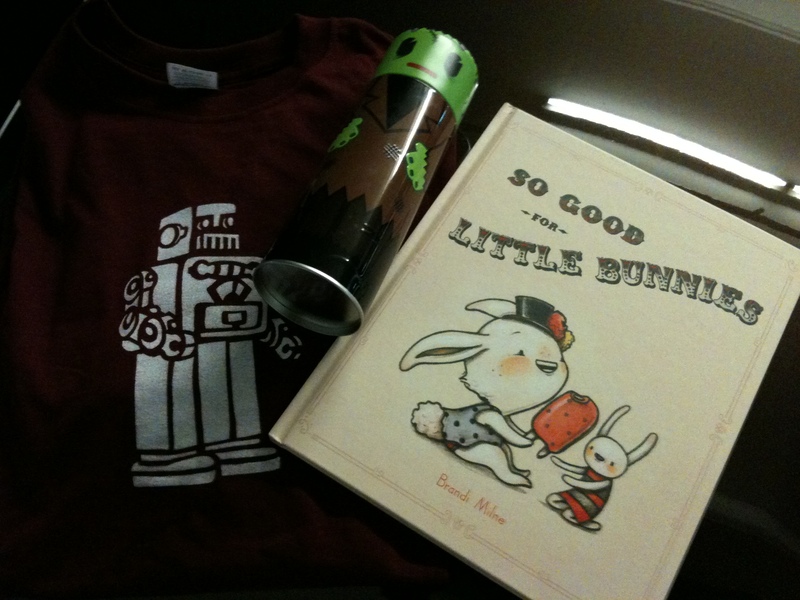 The book is called “So Good for Little Bunny” by Brandi Milne. This was from a combo booth with Griz Grimley and other artists (this might be booth 501). Finally the Frankenstein is a “Kooky Kans” from Mixo (booth 4633). Enjoy the comic con and remember, there are ATMs in the lobby. 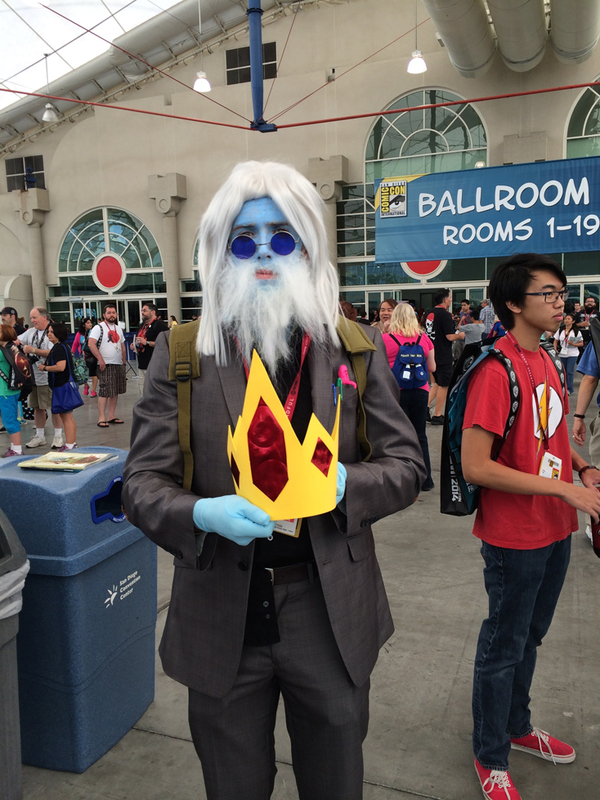 I swept through the San Diego Comic Con like a child in a candy store. So many twinkly and shiny things. As I stumbled around (and into a few fanboys with poster tubes) I snapped pics of my two favorite areas. Warner Bros broke out the Batmobile vault and wheeled them all down. 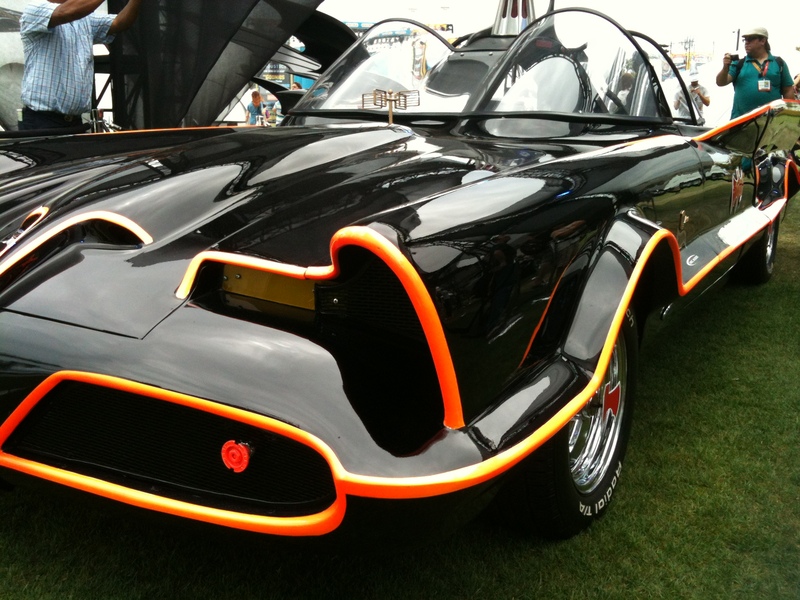 Yes, all the Dark Knight’s rides dating all the way back to the Adam West years. Ogle and enjoy. Adam West’s ride from 1955. It’s a Lincoln Futura featured in the 1960s TV series. 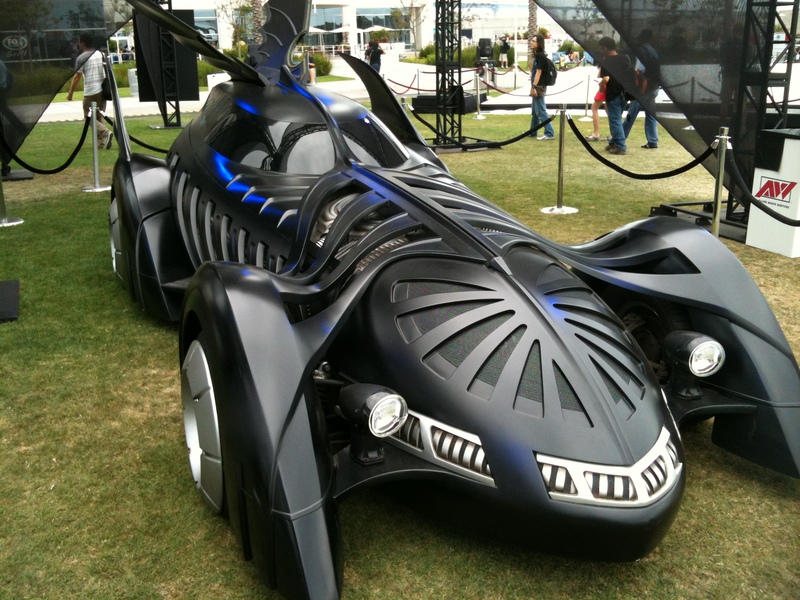 Redesigned batmobile for Val Kimer in Batman Forever, 1995. 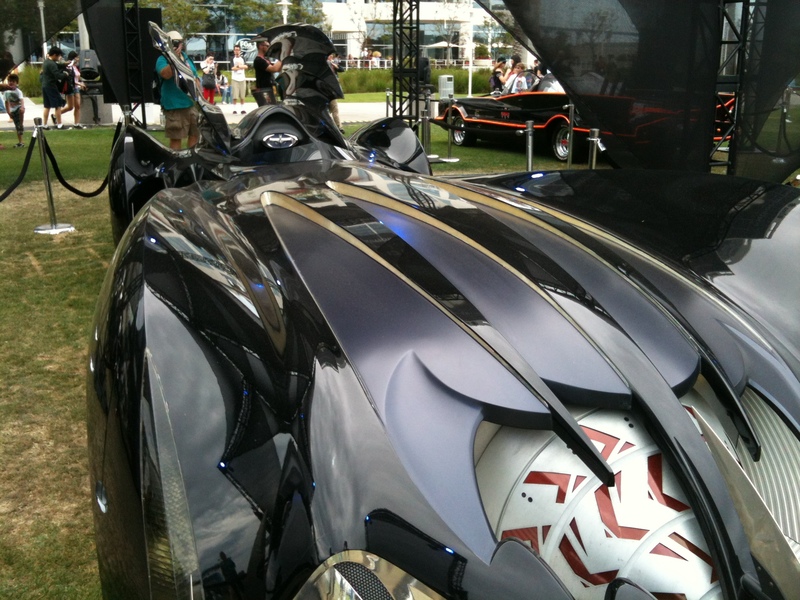 Clooney’s batmobile actually had a top speed of 350 mph and a rocket burner. 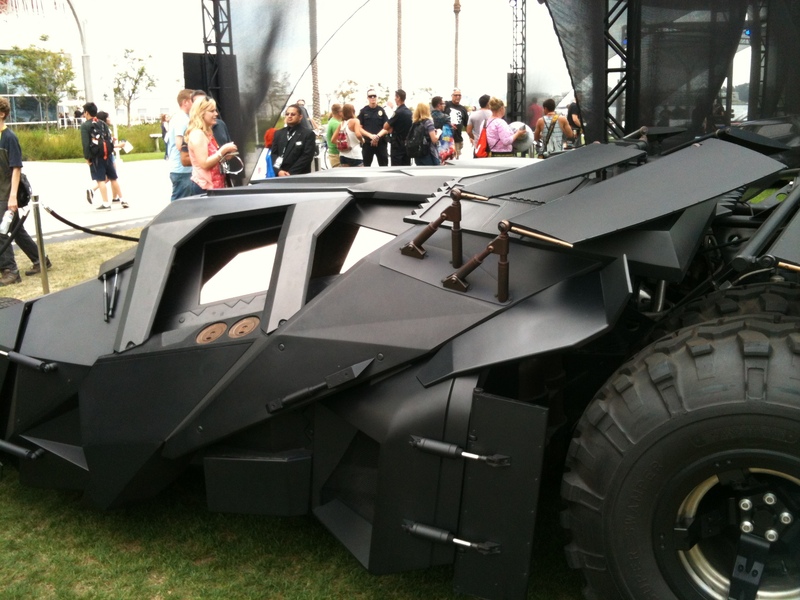 Christopher Nolan’s 2005 Batman Begins featured the “Tumbler” batmobile. That wasn’t all. The folks at Disney were touting Tim Burton’s Frankenweenie everywhere. I grabbed my hall pass and peeked through the stop motion museum. Astounding on so many levels. 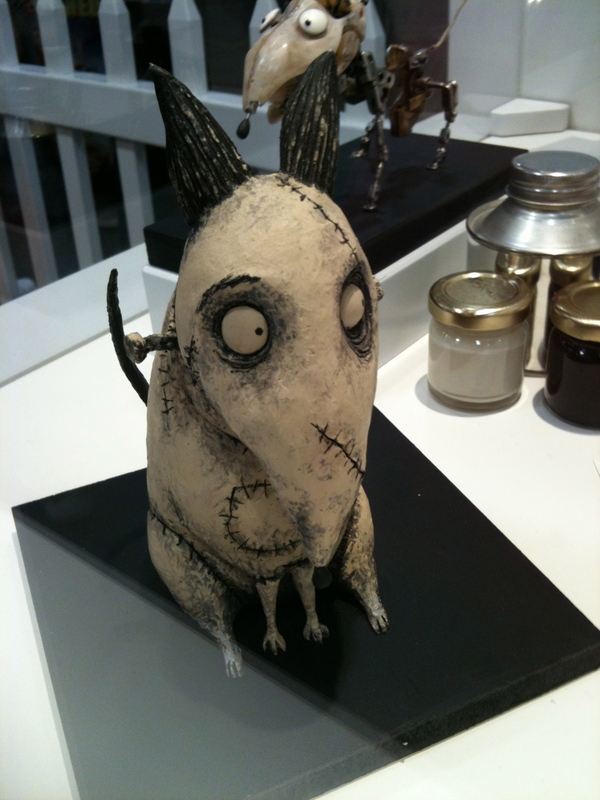 Frankenweenie himself, looking cute and a bit despondent. In the back, you can make out the skeleton used to move the figure. 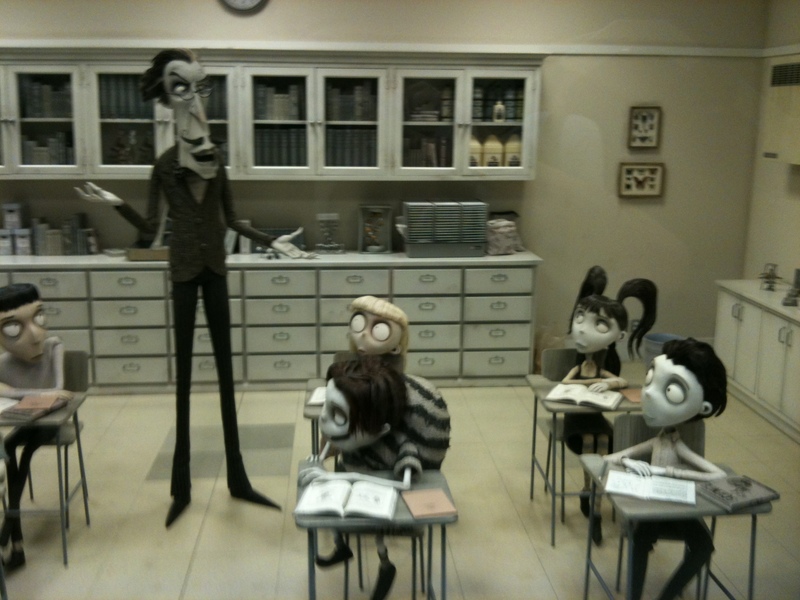 The classroom, complete with Victor, Edgar (as Igor) and the teacher. 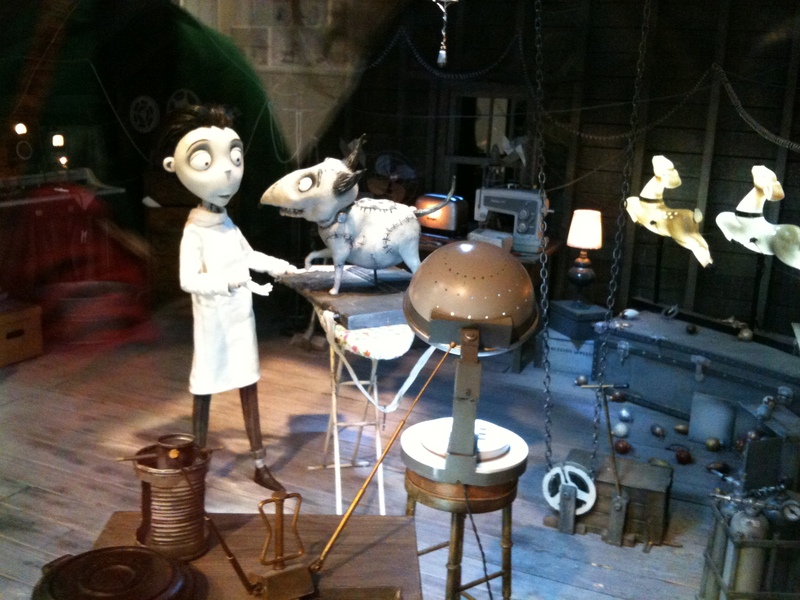 Victor’s attic where he jolts Frankenweenie to life. Outside the official convention was a tent sponsored by Frankenweenie. 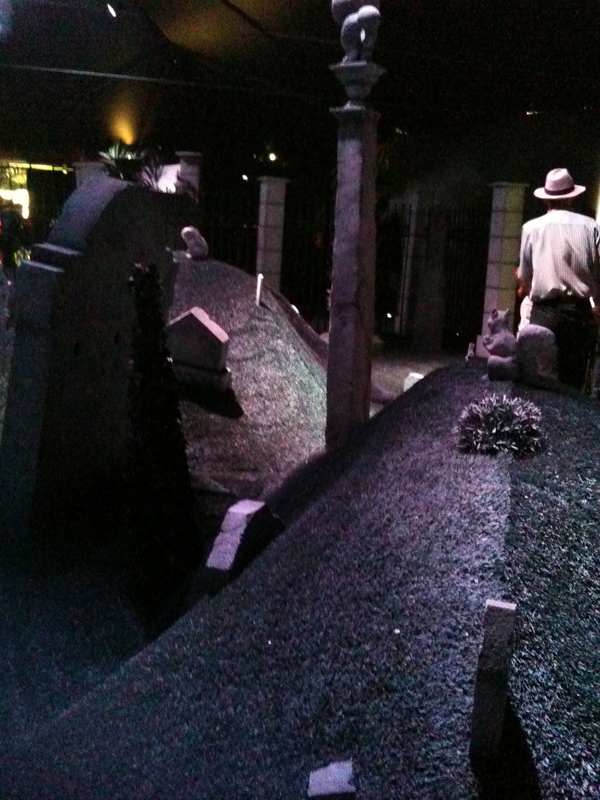 Inside, I found this… a graveyard with carnivorous plants, gravestones, and mist. If you’re still in the convention, check these out. If not, then view and drool. I know I did.